Showbands were quite a popular phenomenon in Ireland. The uniqueness of the showband was documented in the film “The Commitments” which was popular throughout the world. These bands usually had five to ten members and were loved for playing showtunes, pop music, jazz and down home rock n roll greats. Many played the favorite traditional tunes of the area as well and they were extremely popular from the 50s right up until the mid-seventies. It’s amazing how quickly attendance and participation waned when one was targeted so ruthlessly by the paramilitaries of the UVF. The Miami Showband was one of Ireland’s favorite ensembles. They were a mixed band, having members that were both Protestant and Catholic – in fact, one was the son of the Grand Master of the Orange Order in Tyrone – but there were never problems due to the mix. The band traveled a lot and their shows were always well attended, if not sold out. On July 31st in 1975, five of the six members were returning home to Dublin after a show in Banbridge when they were stopped at what looked like an official checkpoint. It was guarded by at least 4 members of the UDR – a locally recruited regiment of the British Army. They were put out of their vehicle by the officers and lined up on the road with their hands on their heads. Perhaps sensing something to come, Stephen Travers got a little nervous when a British soldier who was obviously in charge appeared out of the darkness. His band mate Brian McCoy reassured him saying, “Don’t worry Steve, this is the British Army.” The police, who had bantered with the band, came to attention when this soldier appeared and a chill came over the crowd while the van was being “searched” by officers. They were not searching. They were planting a bomb. If all had gone to plan, the bomb would have exploded later, perhaps even in the heart of the Republic, and it could be blamed on anyone – including the band who were decidedly not political but who had a large Nationalist fan base. The backward theory was that if you attacked what Nationalists like, you would be attacking Nationalists themselves. It also could have been used as an example of why the borders had to be patrolled more extensively as the British government wanted, or it may have been blamed on the IRA. However it turned out, it was going to further stir the pot of the Troubles and it was certainly not supposed to detonate while the band members were standing outside of the vehicle, face to face with the culprits. In a moment of instant karma, the men planting the bomb were blown to bits when it exploded prematurely. Of course, the band would have instantly become aware that this checkpoint was a ruse and that they were in immediate danger. Those who held them also instantly knew that it would not do to leave witnesses alive to the crime they had attempted and they opened fire on the unsuspecting band. Three of the members were slaughtered, including Brian McCoy who had sought to reassure the others when they were stopped. He was shot at least 9 times. Fran O’Toole, the wildly popular and good looking singer, tried to run and was machine-gunned 22 times when he was captured and begging for his life. Almost all the rounds were shot directly at his face. Tony Geraghty also tried to escape but was shot at least 4 times when he was caught by the gunmen. Stephen Travers had been hit by dumdum bullets causing massive internal injuries and was playing dead next to the body of his friend. The injuries and his quick thinking saved his life as he heard one of the attackers say “Come on, those bastards are dead. I got them with dum-dums”. Luckily for saxophone player Des McAlea, the gunmen had not been smart enough to keep track of how many band members there were. He had been blown off the road by the explosion and was hiding in the brush. He remained there until a small fire forced him to move, after the gunmen were gone. He made it to safety and brought real authorities to the scene. To add insult to injury and to show just how insane the times were, the men who had been killed while attempting to plant the bomb were given full honors and military funerals by the UVF. They’ve been treated as heroes in the years since. Luckily, most of the other people in Ireland, both Protestant and Catholic, North and Republic, were horrified by the brutality and the pointlessness of the massacre. It has been called one of the worst atrocities in the 30 years of the Troubles. There were only 3 men convicted of the murders and although they all admit to being at the checkpoint, they claim they were not the shooters. There have been many, many others linked to the crime including Robert Nairac, a captain in the British Army who was likely the man in charge that night but it can’t be proven since the survivors couldn’t identify him or any others who were probably at fault. The Historical Enquiries Team (or HET), formed to investigate the worst incidents of the Troubles, released a report to the families of the showband victims in 2011. In their report, they confirmed Robert Jackson’s involvement. He was a UVF commander and an RUC Special Branch agent, proving that there was at least a little collusion when it came to this incident. Robert Jackson died of cancer in 1998 long before the report was issued though, and the other men convicted of these crimes were released that same year as part of the Belfast Agreement. Stephen Travers has tried to see one of them, to no avail. He did speak with “The Craftsman” – a codename used by a very high-level UVF paramilitary. The Craftsman said the incident boiled down to panicking soldiers and formally apologized for it. Steven Travers, who is a better person than I, has tried to accept the apology. Today there is a memorial set up in front of the National Ballroom in Parnell Square to the Miami Showband and it was unveiled with the surviving band mates in attendance in 2007. They got the band back together the following year but as Stephen Travers has said, that night ruined their musical careers. They will never be able to shake their survivor status and just be talented musicians ever again. In 2010, a commemorative stamp was issued in remembrance of the band. It is poor consolation for the horrors that were inflicted upon them, but it is better than nothing – and considering that there will likely never be any more solid convictions in the case, the least we all could do is continue to remember them. 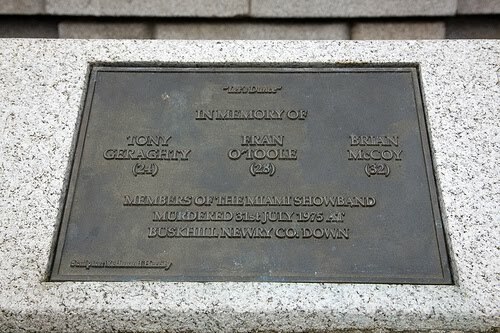 They were Fran O’Toole, Anthony “Tony” Geraghty, and Brian McCoy, killed on July 31, 1975. Des McAlea and Stephen Travers survived the attack, and Ray Millar was lucky enough to choose that night to stay in the North. All were naive young lads in love with music who couldn’t be bothered with politics and who were in the wrong place at the wrong time when confronted with devious men and their violence. They have each paid a horrible and undeserved price. This entry was posted in Death, Ireland, Irish History, Northern Ireland, Politics, The Troubles and tagged Anthony "Tony" Geraghty, Brian McCoy, British Army, collusion, Des McAlea, Fran O'Toole, Glenanne Gang, Irish Music, Miami Showband, murders, music, musicians, showband, Stephen Travers, The Troubles, UDA, UVF.